Of Honolulu, at age 91, passed away on Sunday August 12, 2018. Born in Lahaina, Maui. Retired from The Bus in 1996. 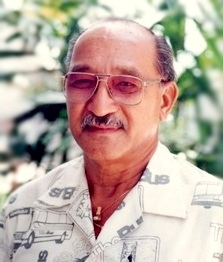 Isaac is survived by his wife of 36 years, Violet L. Kekuewa; Children, Isaac Kekuewa Jr. (Dodie), Lisa Ah Puck (Boy), Jesse Kekuewa, Scott Kekuewa, Ku'ulei Kekuewa; Step-children; Carnation Damon (Keoki), Candy Luna (Edward), George I (Violet), Leroy I, Cora Bush (Patrick), Rodney I (Louise), Randy I (Gina); Siblings, Reginald Kekuewa, Mercedes Hussey, Nyla DuPont; 33 Grandchildren and 46 Great-Grandchildren. Celebration of Life will be held on Sat., Sept. 15th, 2018 at Oahu Mortuary.Visitation at 10:00am, Services at 11:00am. Aloha attire requested. No flowers, please.